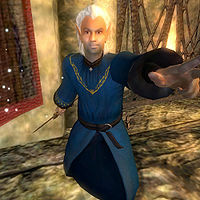 Clanfather Malifant is a Bosmer crusader living in the Sepechra area of Ebrocca. He had the mausoleum constructed after his mother died. However, he fell prey to madness, and after killing his remaining relatives, he has taken up the family tomb as his residence, acting as its caretaker. In fact, his commitment is so profound that he will be found patrolling the area at all times, never even breaking off to eat or sleep. He wears a Heretic's robe, some random upper class shoes and also has a 10% chance of carrying an enchanted piece of clothing. Depending on your level, he may also carry a variable amount of Restore Health and Restore Magicka potions, with an individual health potion having a 19-38% chance and an individual magicka potion a 38-75% chance of appearing. He wields a leveled mace or war axe, which may be enchanted after level 4. Also possesses a leveled dagger, and has a 10% chance of carrying a staff after level 5. He has the standard conjurer birthsign and can cast a standard set of leveled crusader spells along with a Bound Dagger spell. His real name is Ardwe Malifant, which can be found in a note he carries. The first time Clanfather Malifant dies, he will be resurrected immediately. Afterwards he will respawn as normal. This page was last modified on 24 August 2017, at 00:34.